There is nothing worse than spending money on expensive keywords that deliver visitors to your website yet fail to generate any inbound phone calls, engagements or revenue. KeyMetric will help you optimize your pay per click ad spend by identify exactly which keywords and ads deliver valuable phone calls and engagements; and which keywords only deliver costly visitors. KeyMetric enables you to track inbound phone calls and other engagements (forms, emails, live chat, downloads, etc.) from unlimited pay per click keywords, campaigns, ad groups and advertisements. Our session-based Intelligent Number Insertion (INI) means you can track unlimited keywords with less phone numbers than other services. And our integrations with Google AdWords, Google Analytics and Bing Ads allow you to seamlessly import/ export cost data and other information to gain an accurate picture of your return on investment (ROI). To track phone calls from a Google Ads PPC campaign, simply create a pool of phone numbers in KeyMetric to track by campaign or ad group. KeyMetric Intelligent Number Insertion (INI) dynamically inserts a unique phone number on your website specific to the unique PPC ad and keyword (keyword #1) the visitor clicked. KeyMetric dynamically inserts another unique phone number on your website when another customers clicks on another unique ad and keyword (keyword #2). 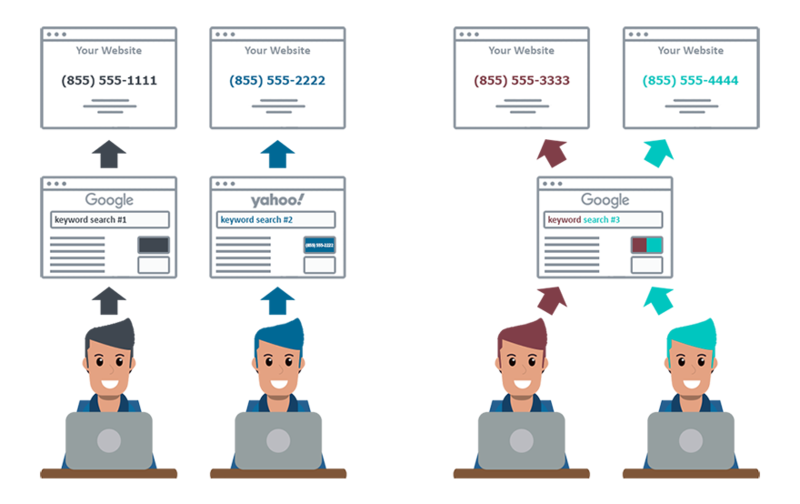 If two or more customers click on the same unique ad and keyword (keyword #3), KeyMetric inserts a unique phone number on your website for "Customer 1" and a unique phone number for "Customer 2." This allows you to track each user session, activity, and phone call separately. This same process applies to an unlimited number of keywords, campaigns and ad groups across Google, Bing, Yahoo, Baidu and other paid search networks. 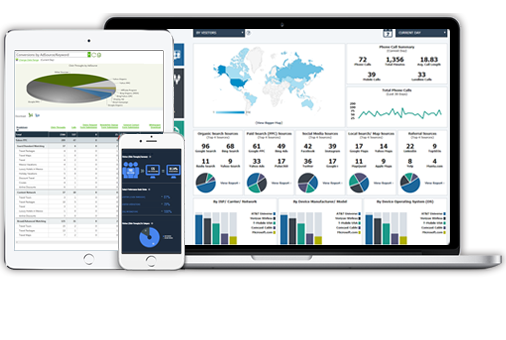 KeyMetric easily integrates with Google Adwords, Google Analytics, Bing Ads and several other third-party reporting services such as Salesforce.com, Acquisio, DashThis and more to marry call conversion data with other key campaign metrics. For customers who are using Google Analytics, and/ or are advertising through Google AdWords we make it easy to view valuable call conversion data within the Google reporting system. Simply provide KeyMetric with your account ID and create a destination goal. The KeyMetric GetCalls API allows for easy integration of KeyMetric call data with nearly unlimited third-party data and reporting systems - ensuring you see the data you need when and where you need to see it to make intelligent marketing decisions. Record every inbound phone call (optional) to identify important trends and information, improve sales and customer service, and asses the quality of your leads, sales opportunities and overall business performance.